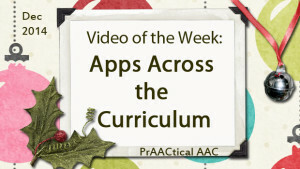 Looking for apps that can help engage your beginning AAC learners who are developing their communication and literacy skills? CALL Scotland’s Claire Harrison has some wonderful ideas for us. Enjoy! We’re making progress in teaching our little AAC learners. We know the pedagogy and evidence-based strategies. But we still have to figure out how to plan engaging instructional sessions with specific activities and materials. While we like to get kids moving and interacting with toys and other playthings, sometimes we also include play and interaction using educational and recreational apps. But which ones? In today’s featured video, SLP Betsy Furler shares some of her favorites. This video was part of the 2017 AAC in the Cloud Conference and we are grateful to them for making it available. If you liked this and other videos from AAC in the Cloud, you may want to participate in the 2018 AAC in the Cloud Conference this June. Stay tuned for details! Our video for this week features Beth Poss, an SLP and AT consultant, with a wealth of experience. In this video, Beth reviews the many ways in which mobile technology can be used to to support the development of early language and literacy with young children who have disabilities. Many thanks to the Center for Technology and Disability for making this available.